Comfortable, clean and quiet, easy walk to historic properties, restaurants, transportation and shopping. Beautiful view. Has parking available, which is a big plus in Portsmouth. Fantastic apartment, comfortable, clean well equipped great welcome pack. It had fantastic balcony with the most amazing views. Location for historic Dockyard and Gun Wharf Quays could not be bettered. Location, balcony, Concierge was very kind and helpful. The light in the apartment is wonderful, and the electric lighting is also good. Communication was great and Danielle very helpful. Location is marvellous and parking good. Good location, apartment very clean and well equipped. Minutes walk from the many attractions, shops, restaurants and bars. Will book again. 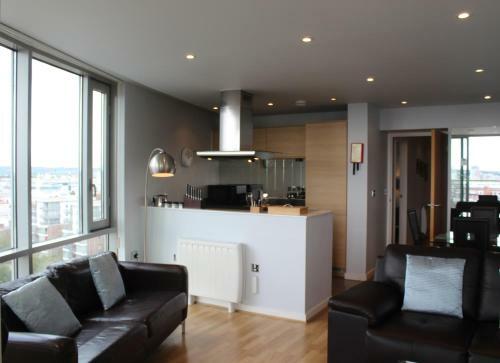 Great apartment in Portsmouth, central to everything. Great communication from Danielle and Jane was delightful and showed us around the apartment. Co-op supermarket is literally 20 metres from entrance of building. Great aspect with terrific views over port. A lovely welcome pack was a nice surprise with bread, butter, milk and eggs. Highly recommend this apartment. Easy access for elderly with a lift from car park to apartment. 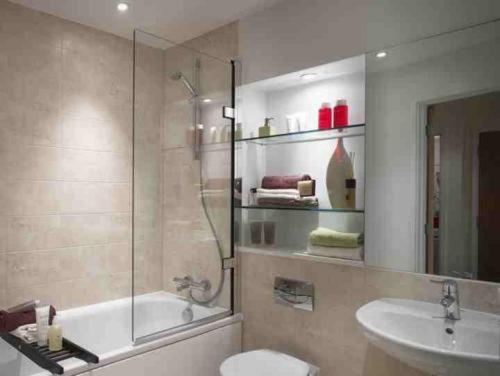 One bedroom has a walk in shower and the family bathroom has a shower over bath. 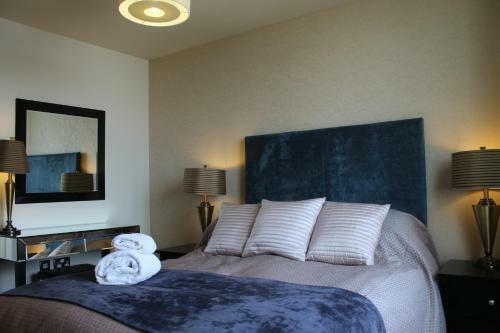 Superb apartment, well placed for attractions and ferries to Isle of Wight. Very clean and well equipped.Easy walk from Harbour station. Thoughtful welcome pack! 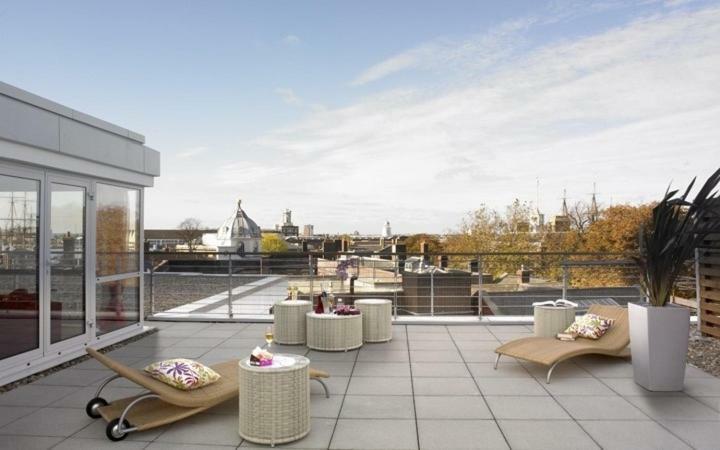 roof terrace would be ideal in Summer! Everything was absolutely fantastic. Including the lady who met us and showed us the apartment- Jane. 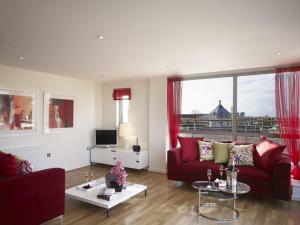 Lock in a great price for Admiralty Quarter – rated 9.6 by recent guests! One of our top picks in Portsmouth – and a guest favorite. Next to Portsmouth Historic Dockyard, Admiralty Quarter is a collection of luxurious, modern apartments in the heart of Portsmouth Harbor's vibrant regeneration area. 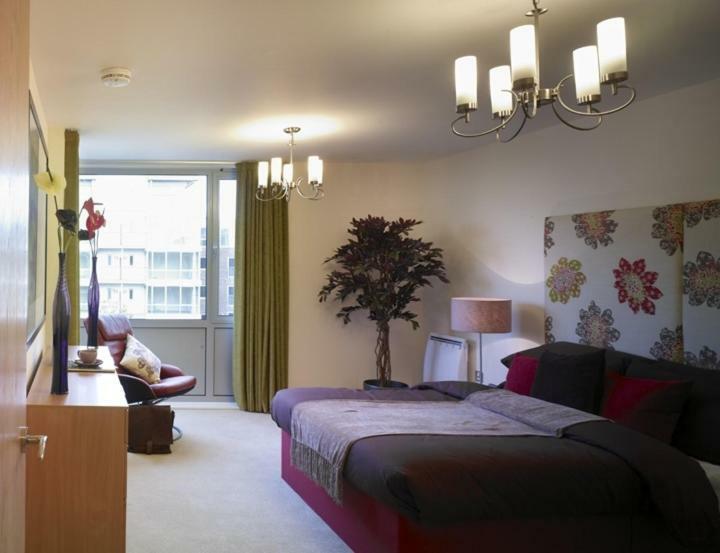 Every apartment is elegantly furnished and stylishly decorated with a well-equipped modern kitchen and a lounge with a flat-screen TV with Freeview digital channels. The 2-bedroom apartment has 2 bathrooms and a private balcony, while the 3-bedroom dual-level apartment has its own private roof terrace. The luxury 2-bedroom apartments have 2 bathrooms and a private balcony, while the 3-bedroom dual-level apartments have their own private roof terrace. The Spinnaker Tower and the designer shops, popular bars and fine restaurants of Gunwharf Quays are just a 5-minute walk away. Portsmouth Harbor Railway Station and ferries to Gosport and the Isle of Wight are also only 5 minutes’ from the apartments. This property also has one of the top-rated locations in Portsmouth! Guests are happier about it compared to other properties in the area. 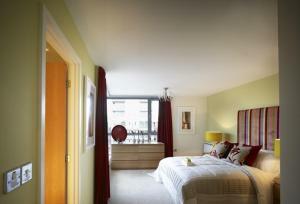 When would you like to stay at Admiralty Quarter? This 12-floor apartment has a balcony, 2 double bedrooms, a kitchen and an open-plan lounge and dining area. This apartment offers 3 double beds. 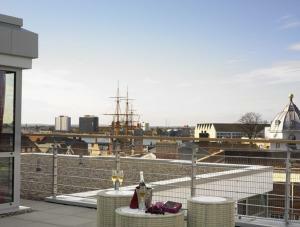 Our properties our ideally situated for accessing Portsmouth Historic Dockyard and Gunwharf Quays. The twelfth floor apartment offers outstanding views over Portsmouth, and toward the Isle of Wight, and the three bedroom apartment has a fantastic open plan living area with a gorgeous terrace overlooking the top of HMS Warrior. We are Portsmouth Naval Base Property Trust, a charity aimed at maintaining and renovating Historic Buildings, Land and Boats for modern day use. Portsmouth Historic Dockyard is an amazing place to go to, there is so much to see and do there. We own some World War Two powerboats which we can take you for a high speed trip on at a discounted rate if you stay in one of our apartments. House Rules Admiralty Quarter takes special requests – add in the next step! A GBP300 damage deposit is required 7 days before arrival (about USD390.29). This deposit will be fully refunded 7 days after check-out, as long as there isn't any damage to the property. Admiralty Quarter accepts these cards and reserves the right to temporarily hold an amount prior to arrival. The Admiralty Quarter requires a GBP 300 damage deposit 7 days before guests' arrival. Keys can be collected between 16:00 and 18:30. Should you wish to gain entrance into the secure car park, you must provide your car registration number before arrival. Please note, only one car parking space is provided with each reservation. A damage deposit of GBP 300 is required. The host charges this 7 days before arrival. That's about 390.29USD. This will be collected by credit card. You should be reimbursed within 7 days of check-out. Your deposit will be refunded in full by credit card, subject to an inspection of the property. Please inform Admiralty Quarter of your expected arrival time in advance. You can use the Special Requests box when booking, or contact the property directly using the contact details in your confirmation. Blackout curtains or blinds are needed in the bedrooms, as our baby granddaughter needs a dark room to sleep. The whole flat is very light, which is generally good, but when the sun shines in there is no escape from brightness or heat. Blinds would be good. Beds were small as we are used to king size. Minor problem with plumbing, otherwise nothing. Carpet from lift to apartment needs to be cleaned. Would have liked bigger bed. Lounge appeared to need better heating but seemed better on third evening - perhaps heating requires to be put on a few days before guests arrive in winter. Secure parking, helpful concierge, good views. Very clean & well equipped apartment. Appreciated welcome pack of basic essentials & detailed booklet giving information about the area. The hard bed and hard pillows, not enough comfy seats in lounge area. The cooker instructions were for another cooker. Fan not working in master bedroom. The smell of smoking in the corridor tomthe apartment. The welcome from host. The location, spaciousness, kitchen facilities and flexibility of having an apartment. The apartment was spacious, clean, fully facilitated, warm and welcoming. The area is fantastic for anything maritime and the pub across the road did an excellent Sunday Roast! Shop underneath, parking and building was secured and safe, Danielle (the host) was extremely helpful and shopping within walking distance. Excellent views to boot!